Imagine you are at a restaurant or even the grocery, and people are staring at you. You feel uncomfortable, nervous, and overall uneasy being out in public at this juncture. While you try not to focus on what people are turning their attention to, it is hard not to angle your thoughts to your imperfections. Missing a tooth is not only unpleasant physically, but also mentally. Whether you lost it from an accident, poor oral hygiene, or disease, it is going to weigh on you and the impact of this one fault. If you have a missing tooth and you are tired of being judged and just want to live your life, we at McCall Dentures in Indianapolis are here for all your dental needs. Our dental office specializes in this cosmetic dentistry procedure. If you are trying to get your oral health and smile back in order, come see our dentist in Indianapolis. In this post, we are going to go over reasons you should consider dental implants, they will bring back your confidence, protect your mouth from more damage, and is one of the best dental procedures that also has the most benefits. Your teeth are in place due to the fact they are packed in by the other teeth surrounding them. When you have a missing a tooth, this causes the mouth to become unbalanced. The teeth will naturally want to shift to fit the gap, since it is considered a foreign space. Your teeth will begin to shift on their own and this can cause problems for the future. If you have a cosmetic dental implant in place of the missing tooth, this will prevent shifting. Having a tooth in the open area again will make the teeth aware that there is no need to shift to fill the space. This will keep your teeth straight and in their proper alignment. Having your teeth in place where they need to be not only helps your beautiful smile, but also your entire jaw. When you suffer from tooth loss, this means the root is missing from the jaw. Because this is occurring, the jaw will begin to deteriorate and eventually start to dissipate. Having dental implants can not only keep your smile looking bright, but they are imperative to saving your jaw. 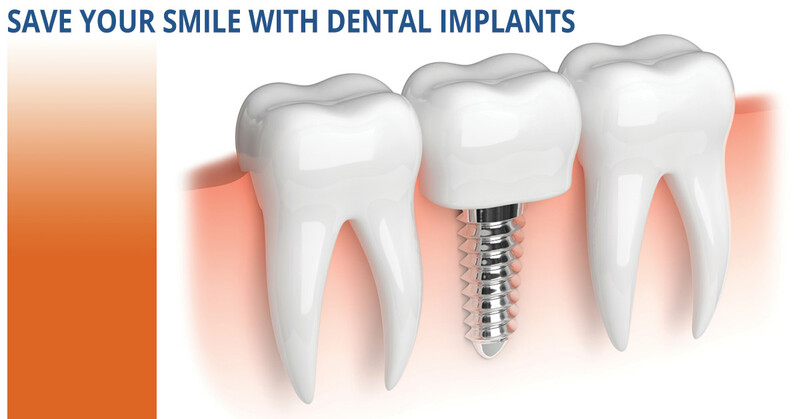 Dental implants have a metal titanium root put in place that will help the jaw stay in tack. Much like how your jaw line deteriorates, your face will also begin to lose shape. When you lose multiple teeth, your face may start to appear sunken in certain spots where the teeth are gone. The face can also be sunken due to the loss of jaw bone. When you choose dental implants in Indianapolis, your face will remain the same and you will be able to keep your youth; a sunken in face tends to make you appear older than you actually are. Come to Our Dental Office Today! Choosing McCall Dentures in Indianapolis is the best decision you can do for your oral health. If you have been working diligently to take care of your teeth and gums, schedule an appointment with our dentist to see if you will be a good candidate for dental implants. Dental implants will help improve your overall health and smile. Our dental office is warm, friendly, and professional, so you never have to feel embarrassed or out of place. Come see us in Indianapolis today!